I have always wanted to try making pizza ground up, never had the confidence to attempt the dough and the sauce. Also, I don't believe you can make good pizzas with the ready to bake pizza-base available in stores. But now, having tried couple of bread recipes and pasta sauces I was pretty confident on the outcome. On a Saturday evening I set out to prepare a vegetarian version, began making the dough, got the desired consistency, and the sauce came out well. I had some regained confidence in me. Baked the pizza, and voilà what a wonderful recipe it turned out to be. 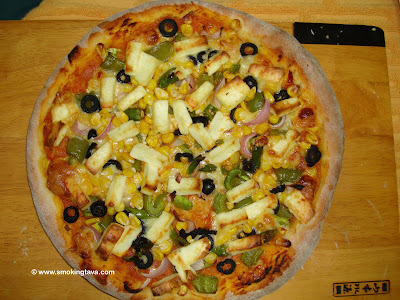 So easy to make, I have decided not to order restaurant pizzas any more. I am sure after you try out the recipe you would more than agree with me :). In small bowl, add water, oil, sugar, salt and yeast. Whisk the mixture thoroughly. Let it stand for 10 minutes. Take flour in a large bowl, make a well in the middle and pour the yeast mixture. If the dough gets too gooey, let it stand for about 5 minutes. Sprinkle some flour on the counter top and knead the dough thoroughly for about 5 minutes. This will help to incorporate some air into the dough and also activate the gluten. Place it back into the bowl and cover with a damp cloth. Keep it aside in a warm place (around 30º C) for at least 2 hours. Meanwhile, lets get on to making the sauce. Cut the tomatoes into half, remove most of the seeds using your fingers. Then cut them into quarters. Heat the oil in a pan, add onion, saute till translucent. Add garlic and the chilly flakes. Saute till the garlic gives off its aroma. Add tomatoes and cook on a high flame till the sauce thickens. With the help of a wooden spoon mash the tomato as much as possible. Add salt, basil and oregano. Cook for another 10 minutes. Switch off the heat, let it cool. Roughly blend the sauce in a blender/food processor. Keep it aside. 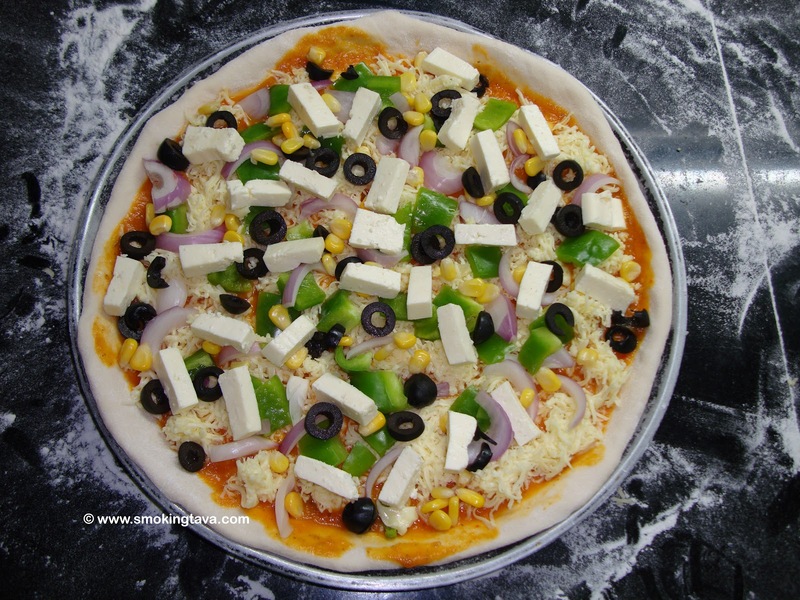 Preheat the oven @ 220º C. Keep the toppings within reach. By now the dough would have doubled in size. Sprinkle some flour on the counter top, and knead the dough to push the air out (this process is called knocking back the dough). Divide the dough into two equal portions. I like my pizza crust thick, but in case you like a thin crust, you can make three out of this batch. If you want do not want to utilize the entire dough now, you could wrap it up in a cling wrap and place it in the refrigerator for later. 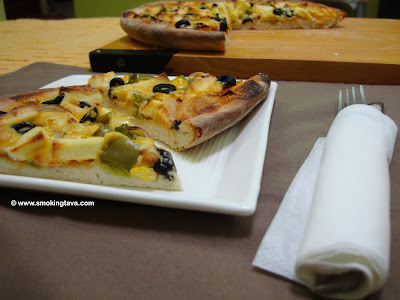 Roll each portion of the dough into a 9 inch sized disc, place it on to a meshed pizza tray. If you don't have space int he oven to bake all the pizza at once, you may place the rest of the dough in a bowl and cover it with a damp cloth. Spread the tomato sauce on the base, cover the base with mozzarella cheese and add the toppings. Pop it into the oven @ 220º C for 20 minutes or until done (preferably in the middle rack, that way it would cook from the bottom as well). Enjoy delicious pizza straight out of the oven.